I enjoyed this book and the unexpected turn of events at the very end. The author makes an excellent effort to continuously surprise us with the steady pace and the well developed characters. I liked the in-between chapters with the reveal of how each character has transformed from the horrid events at the school leavers’ party in 1989 to today. I found that I didn’t care much for any of the characters and was suspicious of nearly all of them, an easy mistake to make when the author exposes how each one was involved in the turmoil of that night. However, each character is unique enough to suggest that they could all be involved in the game played on Louise, creating a tense and uneasy atmosphere that only escalates with each chapter. The author explores controversial current topics that surround society nowadays with ease and a lot of focus. I especially admired the discussion on bullying, fitting in and the notion of how we change (or not) as we grow up. However, the emphasis on Facebook was sometimes too overstated and I felt that the story was exciting enough even without it. I realise that it may be an unpopular opinion because many of us enjoy books where life on social media is analysed, but I personally did not find it as engaging as other readers may do. 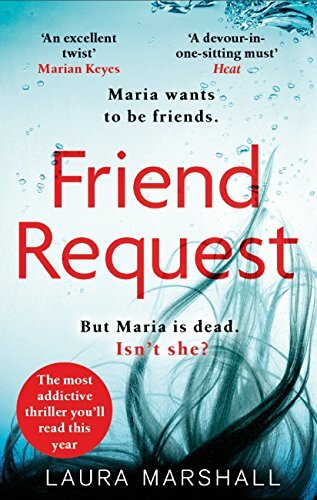 Friend Request is a gripping read that kept me guessing until the very end. The final chapter was completely unexpected but very satisfactory and upon reflection makes a lot of sense when considering Maria’s character and the difficult events she lived through. I would recommend it to anyone who is looking for an exciting psychological thriller, but perhaps not to those readers who do not enjoy the mean girl vibe that is prominent throughout this book. I read this book about six months ago and also gave it three stars. It’s a decent thriller and the mystery is interesting, but it wasn’t outstanding. Great review! Thank you! Yes, I also thought the same. It was interesting but I felt it was missing something. Ooh great review. I should read this. Thank you! Let me know what you think when you do! Great review, again, Darina! It makes me want to read the book, I am curious to see it my opinion would align with yours, especially on the analysis on social media. Love your blog, keep going! I’m not very active on FB and I’m very much aware what I post there so I don’t know how I’d feel about a novel that has such a focus on that social media, I might share your opinion there. Thanks for your great review! I agree that nowadays we should all take care of the information we share on social media, as the events in this book also show. Thank you for taking the time to read and comment on my review! Ouuh nice review; seems really interesting !